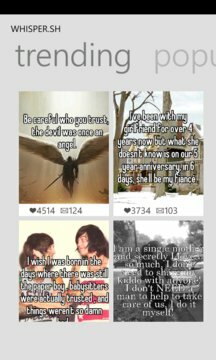 Whisper is a brand new social network that relies on images and anonymity to create connections and conversations. People come here to share their innermost thoughts, dreams and desires without worrying about how their friends on Facebook would judge them or having to delete a tweet after the wrong person sees it. With Whisper you can connect with other people who think & feel the same way you do about things. Whisper is a great place to meet people, whether you're looking for new friends, searching for your soulmate, or just someone to laugh with! 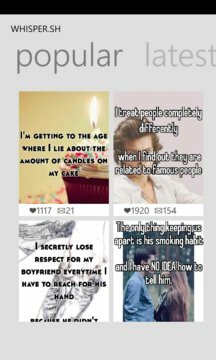 This application is NOT an official Whisper application, but is created by a fan.